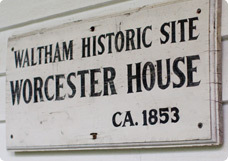 Most of our classes, lectures, workshops and other events are held at historic Worcester House in Waltham, Massachusetts. Other events, including retreats and meditation weekends, take place at Hill House in Plymouth, Massachusetts. Both venues are conveniently located, are wheelchair-accessible and have ample parking. Address: 28 Worcester Lane, Waltham. Google Map. Take Exit 27, Totten Pond Road. At end of off-ramp, turn east toward Boston/Waltham. Continue for about two miles on Totten Pond Road, which ends at intersection of Lexington and Bacon streets. Get into RIGHT lane. Make a very sharp RIGHT turn onto Bacon Street. Almost immediately, take another RIGHT turn onto Worcester Lane. Worcester House (a white, three-story house with a large parking lot) is second house on LEFT. We are located about two miles from the MBTA's commuter rail station in Waltham center, and there is a nearby bus route (MBTA Bus 70A runs from Central Square in Cambridge.). However, these are not very frequent or convenient to our location. Some students without vehicles have successfully arranged a combination of public transportation and carpooling. Address: 549 Mast Road, Plymouth. Google Map. Take Rt. 3 South (towards Plymouth) to Exit 3 Clark Road. At the end of the exit ramp turn RIGHT onto Clark Road. Turn LEFT at the end of Clark Road, onto Long Pond Road. After 1.6 miles, turn RIGHT on to Halfway Pond Road. After 0.6 miles, turn/veer RIGHT to stay on Halfway Pond Road (where the road bends left, just after a yellow sign directing all truck traffic to the left). Drive another 0.9 miles, turn RIGHT onto Mast Road (a narrow, unpaved 2-way road, right after the sign "dangerous curve ahead"). In about a half mile you will see a pond on your right. Pass Agawam Road (on left) and continue on Mast Road until the driveway on your LEFT marked "549"
Go up the driveway and take the first sharp LEFT, and follow the drive to the carport. For more information on how to reach Advaita Meditation Center facilities, please contact us at 781-647-0020 or info@advaitameditation.org.